It all started twenty-five years ago when members of the homosexual community came together to organize the newest chapter of the International Alliance of Courts. Individuals of the city of Hamilton, Brantford, St. Catharines and Niagara Falls successfully petitioned the Trillium Monarchist Society (now known as the Imperial Court of Toronto) to start the Barony of the Steel Knights and Ladies of the Golden Harvest. Today, The Imperial Court of the Waterfall Empire of Hamilton, Niagara, and Tri-Cities has jurisdiction over the regional municipality of Hamilton, the counties of Brant, Dufferin, Grey, Haldimand, Halton, Lincoln, Niagara, Norfolk, Waterloo, Welland, Wellington, and Wentworth. We were honoured to be named one of their charities of choice for the past year as they held several events and fundraisers to give back and support the communities in their jurisdiction. Empress 21 Tasha Stevens and Michael Stevens, Emperor 21 were busy encouraging support and advocating for Women’s Crisis Services of Waterloo Region. 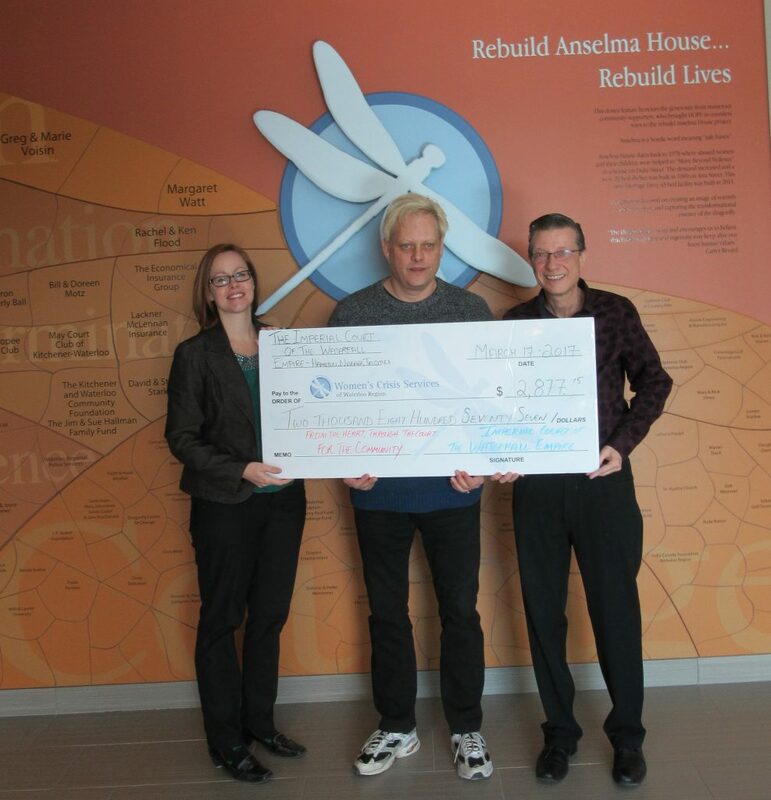 Almost $3,000 was donated to support women and children escaping domestic abuse in Waterloo Region. Thank you for your dedication and for the hard work you did to raise funds on our behalf. Your donation makes an immediate impact on our neighbours, friends, colleagues and loved ones.